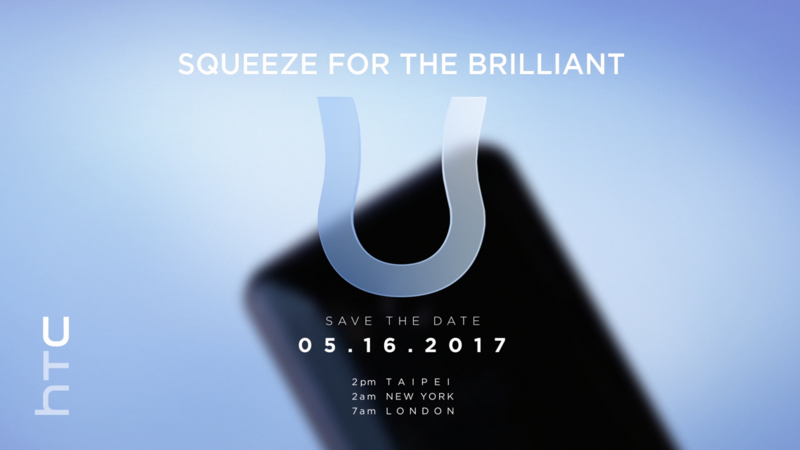 HTC has sent out press invitations for an event next month in which it appears as though the company will showcase a squeezable smartphone. An image accompanying the invitation carries the tagline, “Squeeze for the Brilliant U” along with a date for the event. Over on Twitter, HTC published a brief looping video that appears to showcase someone squeezing the sides of a phone – presumably to activate some sort of function or menu. If the device is indeed as it appears (squeeze to activate), one has to wonder how installing it in a case would impact its use. Last I checked, OtterBox cases remain wildly popular among consumers and aren't exactly flexible. Cutouts could be made, I suppose, but that kind of eliminates some of the "magic" of the effect. The device HTC is teasing is, according to serial leaker Evan Blass, a smartphone codenamed Ocean (likely to arrive as the HTC U). The Android 7.1-powered handset will reportedly feature a 5.5-inch display with a resolution of 2,560 x 1,440, up to 6GB of RAM and perhaps as much as 128GB of local storage (expandable via microSD card slot). It may also carry a 12-megapixel rear-facing camera (IMX362 sensor) and an IP57 dust / water rating. Also worth noting is that it won’t ship with a 3.5mm headphone jack. HTC’s event takes place May 16 at 2 p.m. in Taipei. That translates to 7 a.m. in London and a sleepy 2 a.m. in New York City.